When I meet Evan Alex, the 10-year-old actor who plays both Jason Wilson and his sinister doppelgänger Pluto in the new movie Us, his small frame is practically vibrating with pent-up energy. It’s the end of a long press day, and he is doing his very best to keep his body from wiggling out of control and off the couch. As I watch him work to maintain focus on my questions, his dual performances in Jordan Peele’s latest film come off as even more impressive. There’s a stillness to his character Jason (the son of Lupita Nyong’o’s Adelaide) and a feral quality to Jason’s counterpart Pluto (the son of Lupita Nyong’o’s Red) that feel equally buried inside the boy sitting across from me. A few things I learned while getting to know Alex: His favorite thing to do during the filming of Us was jump around on tables. He was somewhat of a shot caller on set, and according to his telling, the resident jokester. He also really liked his director’s previous movie, Get Out, and thinks the editing especially was done very well. (Let this boy vote for Best Editing at the Oscars!) 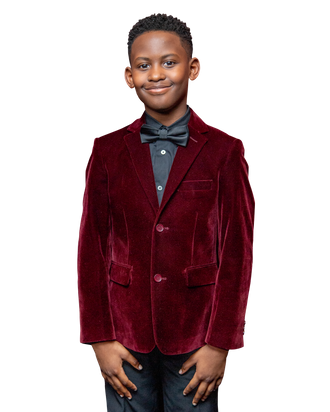 For more on Peele’s littlest new star, here’s what Alex told Vulture about the advice Winston Duke gave him, his opinion on who’s really good and bad in Us, and which superhero he’d most like to play. So, if you weren’t in a movie like this, would you be allowed to watch it? ﻿No, because it’s rated R. But I would want to! And do you like making scary movies now that you’ve been in one? ﻿Yes! I love this kind of stuff! Did you ever get scared when you were filming? I was scared of Winston for sure. It’s his makeup, and he’s really tall. And when he’s in bad form [as doppelgänger Pluto’s father, Abraham], he has this long beard and he’s huffing and puffing, and it’s just really scary. But Winston is really nice. Did you get to help make your character, or did Jordan mostly tell you what he wanted you to do? We were really free to do what we wanted with our characters for most of the time. Jordan is an understanding person. When we started filming, he was like, “Does anybody want to make some changes to their character. If you feel like that then just say something.” So, we were very open to say what was on our mind. And what was it like working with him as a director? Jordan gave me a lot of advice. He’d be like, you have to be able to let an actor move freely, because if the actor or actress is not moving freely, the performance might be messed up a bit. What was the hardest scene you had to do? The closet [in which Jason mirrors the motions of his doppelgänger, Pluto], because it was hard to copy myself. That makes sense. You have to be very precise. Was anything else especially difficult? Yeah, the day we were going back and forth as good and bad, and it was really hot being in front of the fire in our fireproof outfits to make sure we’re safe. My mask is fireproof because if we’re on fire then it will help us. And keeping up the pace with Lupita was a big challenge. She’s just very fast. She’s like, beep, beep, beep! And for running she’s so much faster than I am. How did you go back and forth between the good and bad characters? That seems like it could be hard. You have to understand your character. You have to get in the mood. We would have to think about it for five minutes, and it has to be complete silence. And then we’re in character. And would you stay as Pluto in between takes? I stayed in character sometimes, but it wasn’t that hard for me to get in character. Like, all I have to do is just like crawl around and do some fun stuff. Would you say the Shadow family are the bad guys? A lot of times we talk about them as bad guys, and they are the bad guys, but they’re also good guys, ‘cause they just want to have a life to live for themselves. So, there is no really bad guys and good guys, and they’re just trying to get what they deserve. What does Pluto think of Jason? He doesn’t seem to like him, but he also wants to play with him. He doesn’t want to be his friend. He doesn’t want to get attached because he knows he’s going to kill him, but he’s interested in Jason. Jason is his enemy because his mom doesn’t like him. If the mom doesn’t like him, then Pluto doesn’t like him. Are you more like Jason or Pluto in real life? Um, I’m very different from Pluto, absolutely different. I’m different from Jason, but also like him. I like to do other things. He likes magic; I’m into magic. Oh, you like magic, too? Yeah, Jordan showed me this magic trick. It’s very, very cool to watch. What was it like to film the scenes where you and Shahadi Wright Joseph kind of become action heroes? We enjoyed those days! That whole week it was just like filming me and Shahadi beating up some people. So yeah, that was fun! It’s a very intense movie, but there were a lot of funny parts, too, and Shahadi told me that she gave Winston a lot of the dad jokes he gets to tell in the movie. Um, no, I think I was the joke-telling one. Shahadi was just the one who was taking my jokes! I was the creator. She was just a messenger. So, do you mean you were telling lots of jokes, or are you more of a prankster? Both! One time when we weren’t filming, I hid under the bed and then when Shahadi walked by, I reached my arm out and scared her. Did you ever get advice from Winston? I got tips from Winston sometimes. What kind of tips would Winston give? I assume you saw Black Panther with Winston and Lupita. Do you want to be in superhero movies, too? Yes, I do want to be a superhero. There are so many of these movies, there must be room for you. Which one do you want to be in? I want to be in Black Panther 2! Do you know who you’d want to be? And would you challenge T’Challa for the throne? No! Why I gotta challenge for the throne when I’m the prince of Wakanda?! You’re right. That’s a very good point. And then you’d definitely be more powerful than Winston as M’Baku. Oh, that’s true. And I’d be more powerful than T’Challa. I think we need to start the grassroots campaign to get you in Black Panther 2.